Apenas um quarto de milha por uma estrada de cascalho cênica, forrada com um celeiro, uma cabana de madeira, e três casas de montanha, você vai se aventurar em uma mistura oculta da vista para o lago, grande roda de água de tamanho, vista para a montanha e, finalmente, é magníficas vistas inigualáveis ​​sobre o Rio Chattahoochee do que é melhor descrito como uma cabana na montanha de luxo. A partir de envolver em torno de varandas cobertas que incluem dois exibido em áreas, para a cozinha aberta w / bar de mármore e área de estar, o máximo em conveniência está disponível para seu uso com um estado de arte da cozinha com todos os aparelhos de aço inoxidável. Etapa para fora no deck com seu café depois do almoço ou jantar e ouvir os sons da água caindo do rio. ou caminhar até a pequena área de praia para nadar ou Tubin 'no' Hooch '. Você não vai ficar fora das maneiras de sentar e relaxar ou se você quiser, pode entreter ao gazebo e deck que se projeta sobre o rio. Puxe uma cadeira e sentar-se no convés para a tarde ou construir um fogo na lareira a lenha na sala principal ou na fogueira do lado de fora ou uma fogueira pelo gazebo. Não há falta de atividades ao ar livre disponível hosrse incluindo a cavalo, caminhadas, golfe, ciclismo, pesca e muito mais. O chuveiro ao ar livre não deve ser desperdiçada com água quente. O Alpine Village, Helen fica a 15 minutos com vários restaurantes e atrações. Muitos vinhedos e vinícolas estão com 5 milhas e alguns têm música ao vivo, bem como passeios de degustação. A banheira de água quente com áreas deck com vista para o rio está pronto para sua apreciação verão ou inverno. Estado da arte sistema Direct TV está disponível em todos os quartos com HD DVR incluído. Acesso à Internet está disponível. Chamamos a isto a melhor experiência Camping, por que não fazê-lo. Um contrato de locação assinado será enviado por e-mail, que deve ser preenchido e devolvido para finalizar a reserva dentro de 24 horas. Limite de 25 libras para cães, rigorosamente aplicado. Sem gatos. What a great time we had at this place!! Beautiful home and an amazing view over the 4 acres down to the river. Super quiet and secluded. Cups of coffee listening to the birds or a beer while bbqing on the grill. Paul was super accommodating when we had some initial troubles with the hot tub. We appreciated that!! Thanks again for a great family time at your place. We had a fabulous stay! Home is exquisite - so much room and very well decorated and maintained! We absolutely loved the property ... landscaping is beautiful and so impressed with the river access from the large, private, backyard! We hope to visit again soon! Great location too! Owner is very responsive and attentive to every detail! 5 stars ! This was our 3rd stay at the Heavenly Hideaway! Loved every minute like usual. The house is always very clean and beautiful. The scenery is amazing!!! I highly recommend a stay here. My family and I stayed over the Christmas break. The house is wonderful for a family gathering. Our son and daughter and their spouses spent the week with us. Other than some uncooperative weather, it was a great week. The house accommodated all of us with plenty of room. We loved the basement game room compete with a pool table. The kitchen was well equipped with a couple quirks in the appliances easily overcome. It should be pointed out that the master is on the main floor with two bedrooms upstairs. The upstairs bedrooms share a shower but have separate sinks/toilets. The basement also has a bathroom with a shower/tub. We did not use the outdoor hot tub bit it looks like it would be nice to use in the spring/summer/fall. The house sits on a hill above the Chattahoochee River. Getting to the river/gazebo can be tricky as what steps there are can be slippery. There is a working road to get down there so we never took the steps. Overall we had a great time. I imagine warmer weather would allow better use of the outdoor amenities. We really enjoyed our stay at Heavenly Hideaway. The place has a really nice layout with lots of porches. The décor is tasteful and suitable for the home and location. Kitchen was well provisioned with anything you need. Granite countertops in the kitchen and master bath. Garden tub and walk-in shower in master bath. Upstairs bedrooms are large and share a jack-and-jill bath. Pool table and den downstairs were a pleasant surprise as I hadn't noted that in the write-up. The weather didn't cooperate, so we didn't get to take advantage of the Chattahoochee River or overlooking gazebo, but you can see them from the living room. We did indeed see deer and turkeys in the yard; no bears though! Owners are well-organized and are obviously experienced landlords. The process is a little rigorous to make the rental, but it's clear to me that is the reason the place is so well taken care of. I don't mind a little extra paperwork to get a home like this one! 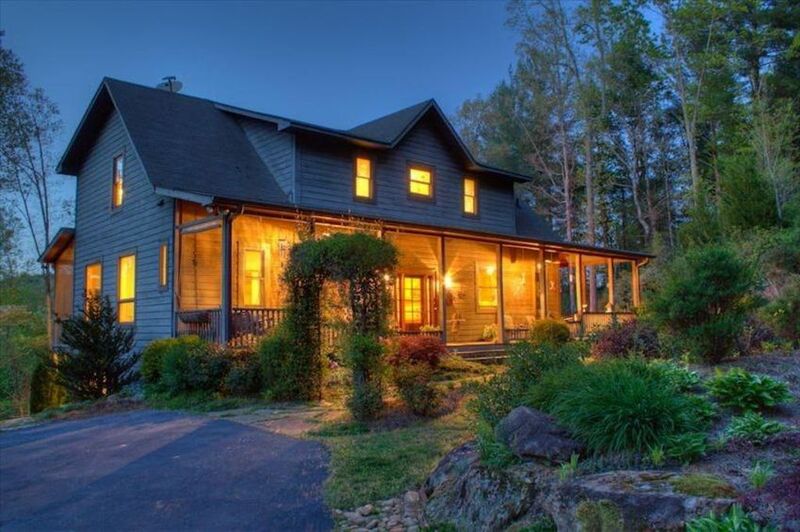 Heavenly Hideaway is a beautiful home in a quiet setting, directly on the Chattahoochee River (get ready to see deer and other wildlife directly from the balcony!). The home is very clean inside, well-kept and well-stocked. It's an easy drive to Helen and surrounding towns--lots to explore within a 20 mile radius. The only issue we had was the hot tub didn't heat up very well (owner was made aware of this). The homeowner, Paul, is very responsive to emails and wanted to make sure we absolutely loved our stay.